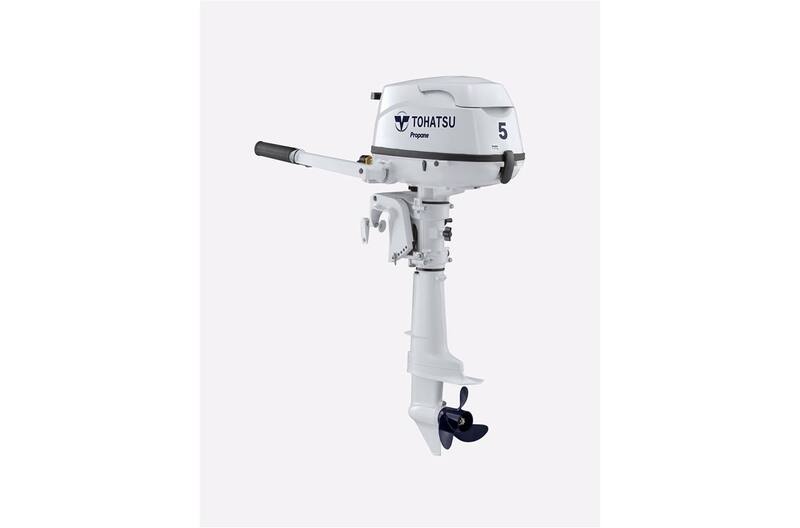 Thanks to Tohatsu's 5hp Liquefied Petroleum Gas (LPG) outboard, sailors are no longer forced to carry gasoline on board. The 5hp LPG comes equipped with a fuel line that will connect to any standard North American propane tank. Our innovative LPG outboard will run for a full 5 hours at WOT on a single 11lb propane tank, without sacrificing performance. Exclusive to Tohatsu's LPG outboard is the Safety Fuel Shut Off Valve which keeps propane fuel from continuously running when engine is not in use. Plus, since the 5hp LPG does not require ethanol or gas, this propane outboard requires almost zero maintenance on fuel related components. We offer a 20" and 25" shaft Sail Pro model which includes a 12V 60W 5A charging system and high thrust prop. What sailor doesn't want a virtually maintenance free engine that has their back? Front Mounted Shift Lever: Tohatsu's front mounted shift lever, an industry first in its class, allows for easy shifting and maneuverability. Propeller Hub Exhaust: Through-the-prop exhaust helps reduce engine noise. Larger Carrying Handle and efficiently designed Holding Grip on bottom cowl: Tohatsu installed a holding grip on the bottom of the cowl as well as a larger carrying handle, making transporting this compact model even easier. Safety Fuel shut-off valve: keeps propane fuel from continuously running when engine is not in use. Propeller Selection Range: 6 in. - 9 in. * Weight specification is based on the lightest version. ** Optional on short shaft model, standard on Sailpro models. Specifications and descriptions are subject to change without notice.